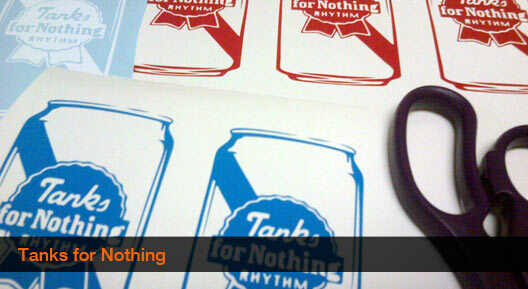 In addition to working with screen printing and sewing, we also work with vinyl, using our specialized cutter. From single color die cut stickers, to oversize banners with multiple colors, we can do it all. We offer a wide variety of colors, and dirt cheap prices. We're constantly playing around with vinyl, and always looking to do something new. Heck, at one point we even started making fabric stickers! So if you're interested in finding out whether or not something is possible, or are looking to get a batch of fresh stickers made up, get in touch!